In the late 1940s my wife's grandfather owned a 1929 Rolls Royce Phantom 1 Shooting Brake, much like the one in the image. He and seven friends arranged a trip to Austria to buy motorcycle parts. They set off from England and arrived in Austria in the evening. It was mid-winter so was dark. The place they were to buy the parts from was a castle atop a mountain. Wife's grandfather was driving and his cohorts were asleep when they arrived at the castle, having traversed a winding mountain road to reach it. Once at the castle they were greeted with surprise, and handed a medal. They were the first people ever to have driven up the castle's approach road in the dark. In the morning they walked out of the castle gates and viewed the road. It was an icy, hairpin infested track with no fence or wall at the edge. One slip would have meant plummeting to certain death. 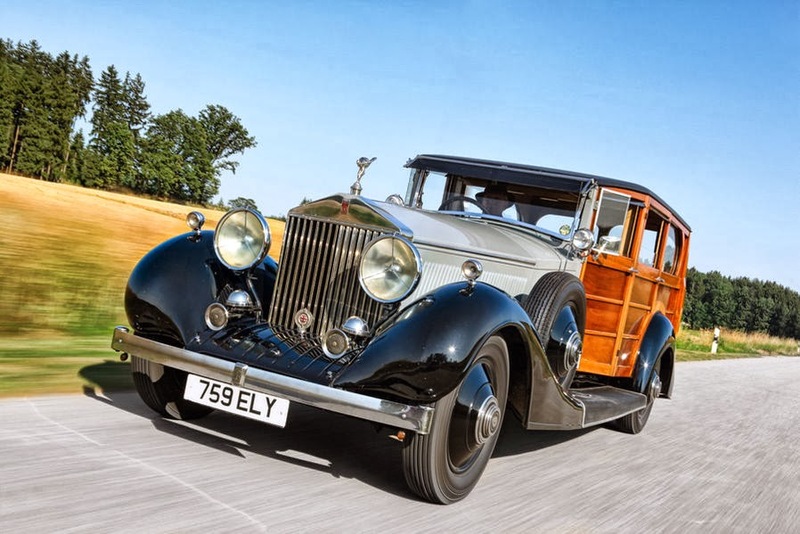 I mention this story because a 1929 Rolls Royce will have had utterly dreadful lights. And those in my 1986 Porsche 924S aren't much better. I recently drove 300 miles in a day in the Porsche, of which 140 were spent in darkness. The dark part of the journey was from the Devon coast, up the A30, the A303, A34 and finally the back roads to home. 95% of the journey was unlit by street lamps and a substantial proportion involved single lane roads. I absolutely love the Porsche to bits but it is rather challenging to drive in the dark. Car enthusiasts everywhere love classics, and classic cars come with several features that we ignore in the summer, but that come to light in the winter. Lighting, inside and out is the major one. Modern cars come with all sorts of lighting to help the driver find the car, get in it and find things in it. Press the keyfob on a Range Rover Evoque and a pool of light, with a Land Rover logo inside it, is displayed aside the doors. 99% of old Defenders don't even have functioning interior lighting. Jump in a Jaguar XF and there are lights everywhere. Low key and subtle but of great help to the occupants. The dash is lit up like a christmas tree. It all looks rather wonderful. My Porsche has no central locking, so you have to find the lock in the dark. You jump in it and a single light flickers into life. Shut the door on a modern car and the interior lights stay on for a few seconds before dimming to nothing. Shut the door in the Porsche and you are in blackness. You find the ignition to insert the key then fumble around trying to find the headlights switch. Turn that on and the lights flip up and the interior lighting comes on - dimly. You can see oil pressure, voltage, the clock, fuel level, engine temperature and speed. The rev-counter bulb is not working. Then we come to the headlights. They are dire. Drive a modern Volvo in the dark and it's like you have your own personal patch of daylight ahead. Drive a classic in the dark and you struggle to see much at all. I drove most of those 140 miles in the dark with my main beam on. It doesn't seem to annoy anyone. I only turned main beam off on left hand corners, when it would shine right into oncoming drivers eyes. Otherwise, I left them on. At this point it's worthwhile making a point. I always used to think I had poor night time vision. Now I have come to the conclusion that I don't, but that I am hindered by night time driving because I like to see the road ahead, and the next apex. Most drivers just look at the road ahead of their car whereas us petrolheads are continually on the look out for potential hazards, and as far into the distance as possible. We have to alter our mindset for night-time driving because we cannot see as much as we feel comfortable with. Back to the main point. When it rains the wipers, positioned so European and American drivers have a clear windscreen, clear just over half the windscreen in front of the UK driver who sits on the correct side of the car. The Porsche, like many classics, has no ABS or traction control. And it's rear wheel drive. Slippery conditions mean careful judgement and application of brakes and throttle. This all makes for an intense driving experience. But despite all the issues caused by running a classic car in the winter months I love it. It requires an extra level of concentration that modern cars with brilliant lighting, driver aids and adaptive cruise control just don't. It's exhilarating rather than relaxing, and, for a car enthusiast, that is nirvana. I arrived home after my day out at midnight. I was buzzing from the drive and stayed up for another hour because I wouldn't have gone to sleep. It was a similar feeling to that after a session on a race track. You just don't get that in a brand new car.